At this point, you would have to have been living under a rock or out of the hobby not to know that Value Gear is THE source presently for outstanding stowage at a reasonable price. Value Gear's stuff ends up on or in just about every one of my builds these days, but one thing has held me back from using these nifty little boxes, tarps, barrels, knapsacks, etc. They don't stack very well. The crates stack fine, but the tarps usually are meant to be laid on flat surfaces. And if you have a load of stuff, you will have to scratch-build your own tarp if you want it covered over. Soldiers have tons of stuff they need or want to carry around with them, and they usually pile that stuff pretty high, often overloading their vehicles. So I suggested to Value Gear's owner and resident genius, Steve Munsell, that he should look at having stacks of stowage that would fit in the truck beds of the many softskins currently making their way to market in styrene kit form. The result is a new line of stowage measured to fit specific vehicles, especially the nearly ubiquitous Opel Blitz. The entire set of four stowage combos for German trucks looks amazingly realistic: various cargo combos, most of them draped over with tarps. Value Gear's resin cleans up easily (the instructions recommend de-greasing, but I often paint these items straight from their baggie). There is a minimum of flash, and sink holes are usually non-existent. 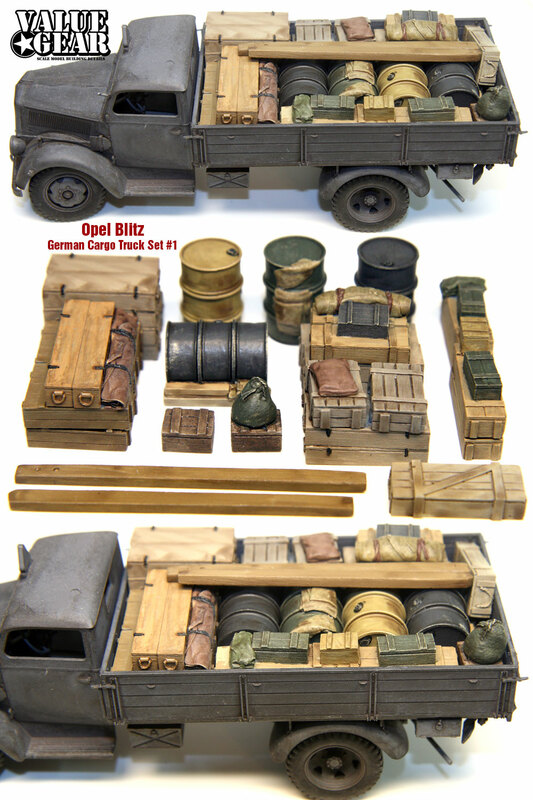 The thing that makes these sets so useful is they will work almost anywhere: while this set is designed for an Opel Blitz, you could adapt it to anything with a storage bed (Italeri's Mercedes-Benz L4000 for example). As far as "reviewing" this set, the uses and advantages of it are pretty self-evident. If you haven't discovered Value Gear yet, then it's about time. And if you have, these dedicated sets are the next logical step. Thanks to Value Gear for providing this review sample. Be sure to mention that you saw it reviewed on Armorama when ordering. Highs: Crisp details, measured to fit the load beds of Opel Blitz models, no real mold-release issues. Verdict: Highly-recommended. Perfect for a variety of vehicles besides the Opel Blitz.